Aspects of the author’s journey are common to many Christians. His chapter “Integrating two Worlds” will be a help to any Christian in the marketplace -it is an issue that continually manifests itself. The phrase “I found that my growing faith was often relevant to work issues – but the reverse was also true. 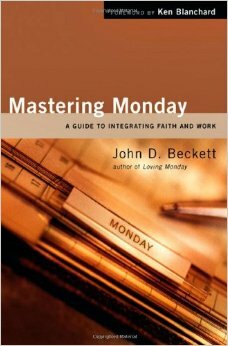 Workplace issues challenged and strengthened my faith, occasionally more than I anticipated.” provides an encouraging perspective. The author shares his own experiences in this realm – in a transparent way that should be encouraging to all who read. The section “Companions on the Journey” provides a number of biblical stories and characters from which much is to be learned and applied to our work world today. These are not one size fits all stories, but the characters and illustrations the author selects will provide much to think about. This is mixed in with some stories of contemporary business leaders and recent situations they have faced and their responses. Finally, a discussion of God’s workplace agenda and what theme’s the author believes are critical in this discussion. In light of some recent business failures (more specifically failures of leadership) – this section does a good job of connecting the themes to “good business”. It is a reminder of what really matters – and some encouragement to have the courage to do the right things. This is a pretty quick reading book, but I don’t think it is a read once and put it on the shelf. I’m sure I’ll be referring back to it every year or so to remind myself of proper perspectives and to be encouraged in my work. Hardcover: 206 pages. Publisher: InterVarsity Press (July 30, 2006). ISBN-10: 0830833854. Price: $12.24.